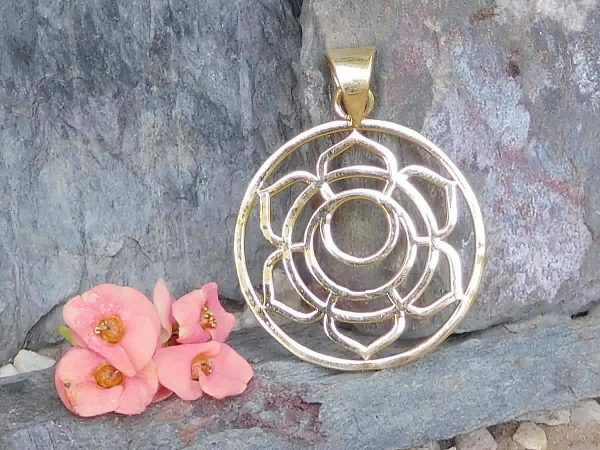 This design symbolises the sacral or ‘swadhishthana’ chakra, which in yogic tradition is the second stage on the path to enlightenment. At this stage the focus is on discovering yourself and improving your self-confidence through experience and enjoyment of all the senses. Many people will see an offset circle within 6 lotus petals. Actually it is the crescent moon beneath the circle, hidden in plain sight, wherein lies the mystery of this magical symbol, the real you waiting to be unlocked! Stamped and hand-crafted in nickel-free brass.